Summer is on my mind. Probably because we don’t have a/c in our old New England farmhouse. Oh, we’ve gotten good at when to close and open windows and shades over the years to deflect the sun and the oven-hot rooftop breezes. 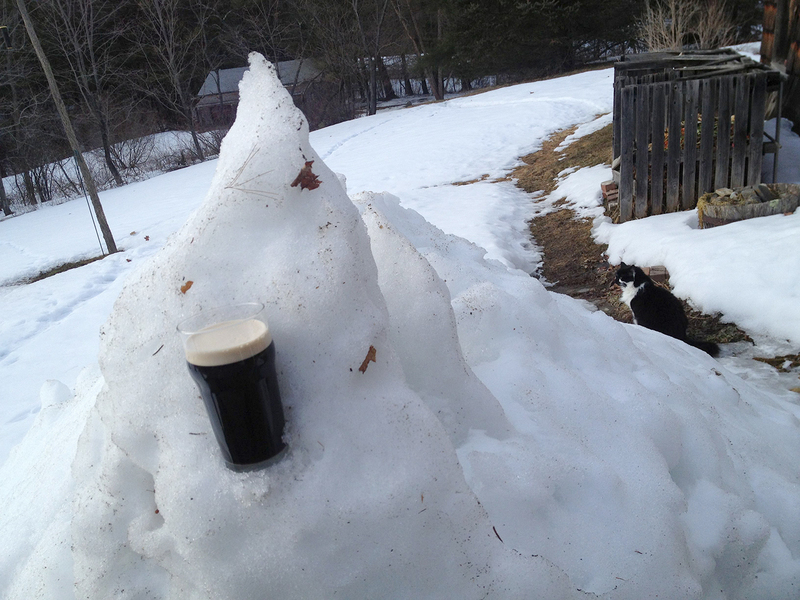 Even with strategically placed fans sleeping for the handful of really warm nights in Maine can present a challenge. Plenty of porch time is my solution. 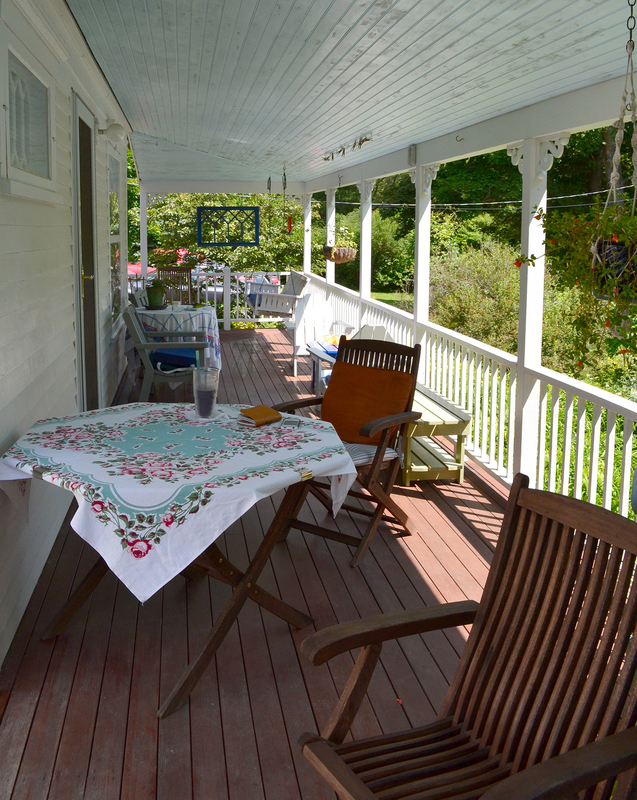 By early afternoon, the sun has finished baking the front decking and a good breeze begins to traverse the length of it. A cool fruit smoothie, a new Davis Leatherworks tooled notebook (a gorgeous, US-made version of the Midori Traveler’s Notebook), toys to play with and plenty of pets with Mr. Wonderful made for a perfect holiday at home yesterday. 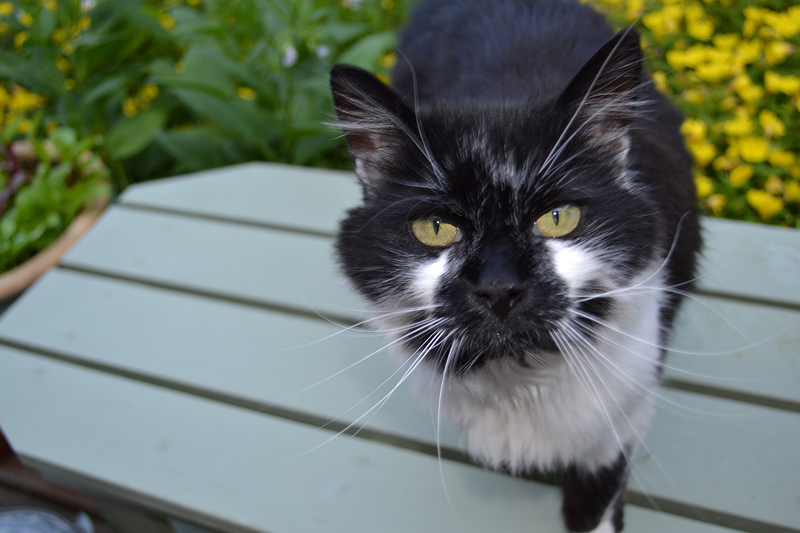 Categories: Cat-related, cats, outdoors, photography, summer | Tags: cats, Davis Leatherworks, front porch, gardens, insects, Maine, Midori Traveler's Notebook, notebooks, outdoors, photography, summer, weather | Permalink. 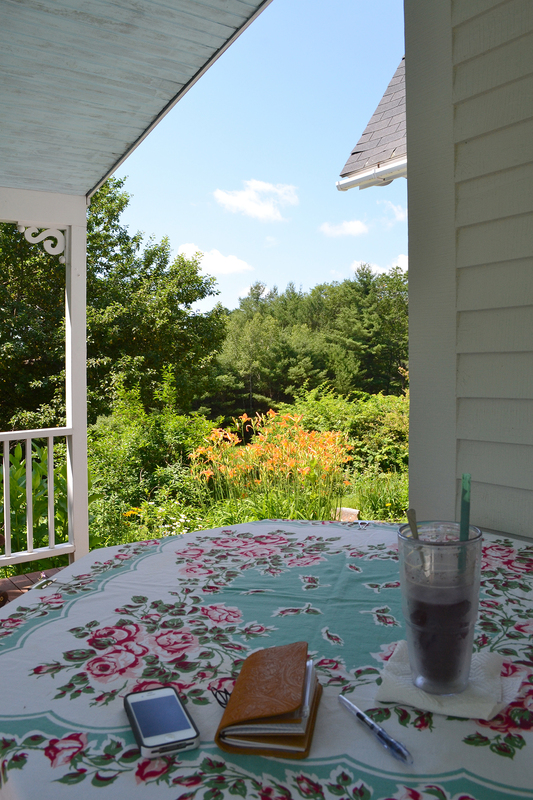 It’s finally summer in Maine — I’ve been waiting for comfy porch weather and it’s here in spades. 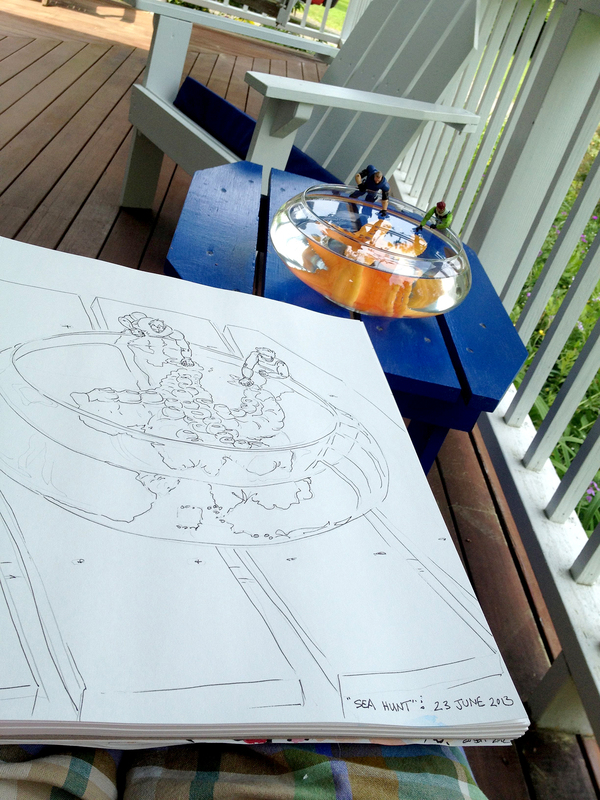 I love the afternoon breezes that keep that side of the house cool, the porch is perfect for hanging around, sipping iced tea (read: beer), drawing in a sketchbook and playing with my toys like any other respectable grown woman would do with her free time. 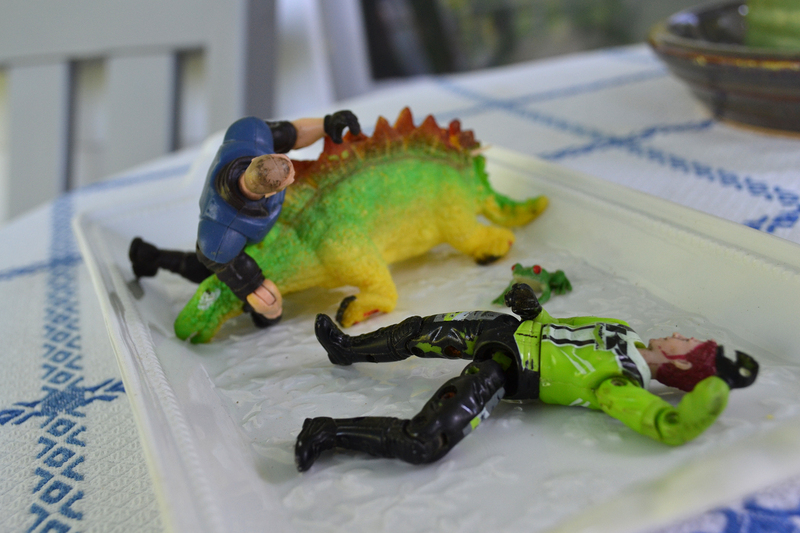 A few weeks ago, I had Stego, the expanding dinosaur sponge in a gladiola vase. Fun to watch him grow and to sketch his progress. 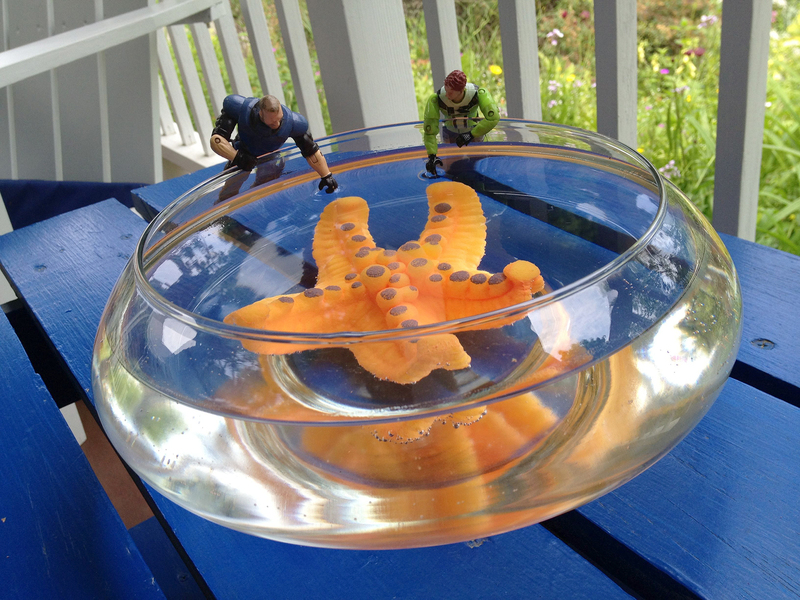 Now it’s Stella the sea star in the spotlight. Stella and some kid’s toys I found on the walking trail. Finders keepers, kids. Oh, okay, I’ll put them back on the trail when I’ve had my fun. The last rain storm washed away the rest of the pine pollen and I no longer have those pesky allergy symptoms dogging me, so I’m one happy camper. 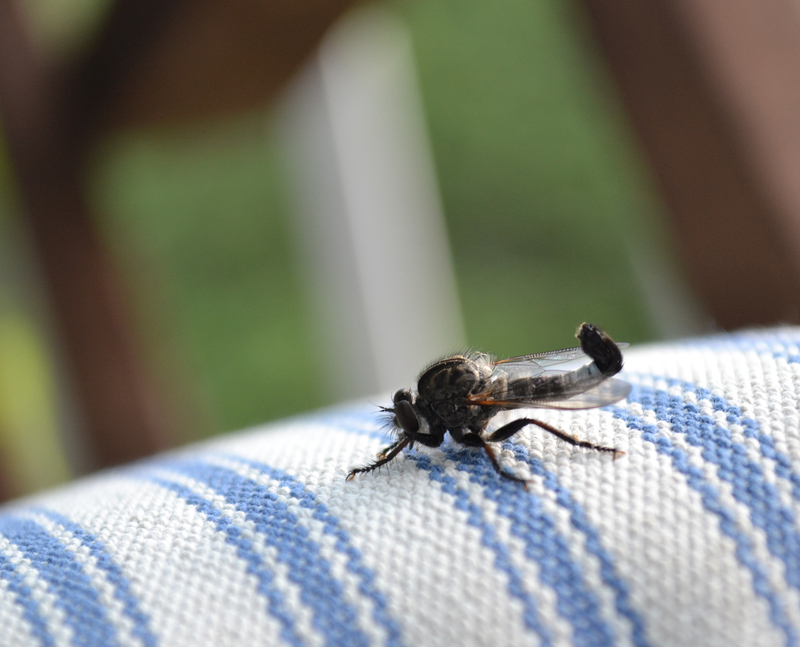 Categories: beer, outdoors, photography, spring, summer, Updates, weather | Tags: children's toys, drawing, front porch, Maine, photography, pine pollen, sea stars, sketching, summer, watercolor painting, weather | Permalink. The photo within this photo was taken by Gregory Rec, Portland Press Herald, Portland, Maine. The sun is back! We have lingered on the western-facing deck the past two afternoons to soak up some rays — really just an excuse to take the cure: Hang around doing nothing, drink a few beers and act like it wasn’t still winter in Maine. 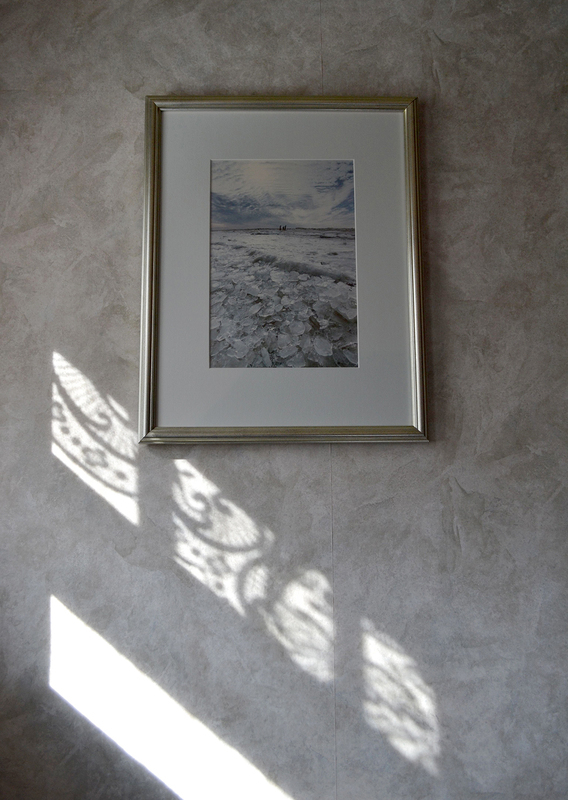 This morning the light in the stairwell was so beautiful I had to try to capture it in a photo. The photo below was taken Friday afternoon. The Cabin Fever Snow Pile Races snow pile is still massive but pithy and not strong enough to withstand races anymore. This afternoon will likely present another fine opportunity to take off my fleece sweater, roll up my jeans and bask in the warm March sun and perhaps enjoy a brew … or two. 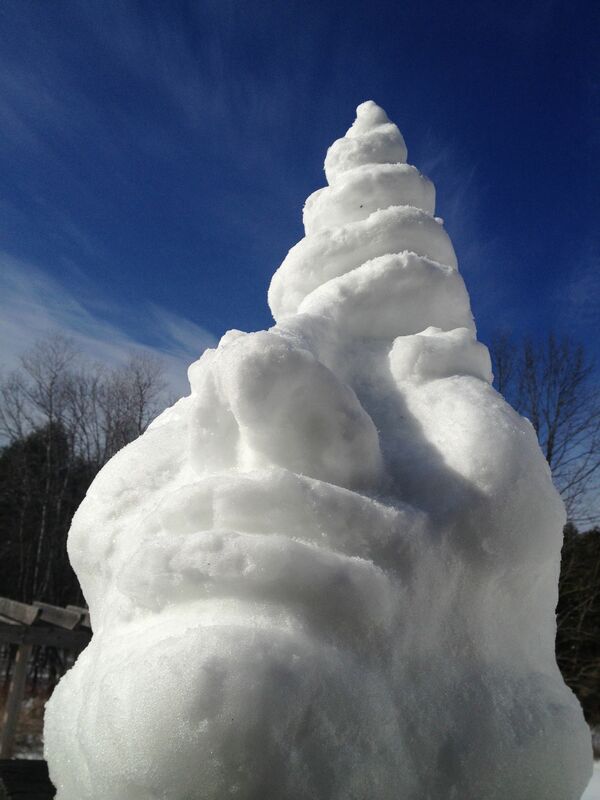 Categories: beer, photography, Snow creatures, spring, weather, winter | Tags: Cabin Fever Snow Pile Races, ice, melting, mud season, outdoors, photography, Presumpscot River, shadows, snow, snow sculpture, spring, weather, winter | Permalink. 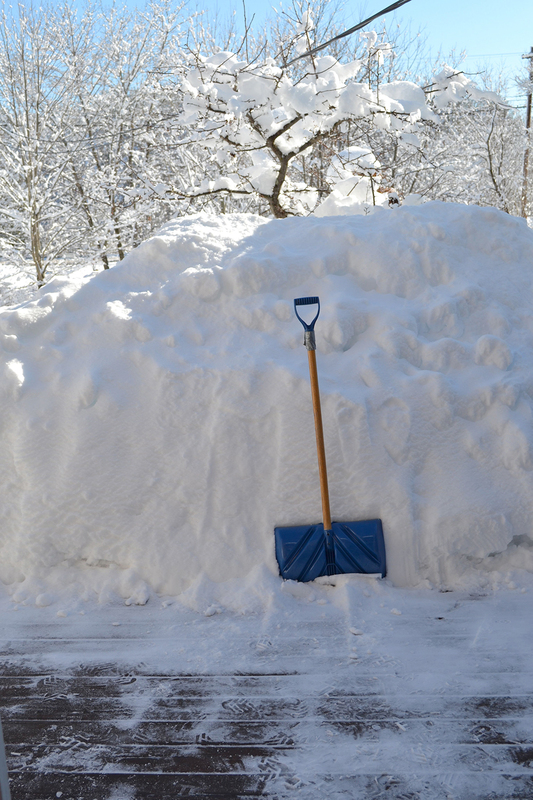 To Old Man Winter, I say, “Uncle, already!” The snow pile outside the front breezeway door is over my head and my favorite snow shovel (yes, I have a favorite snow shovel) is wrapped with duct tape to keep the handle on. 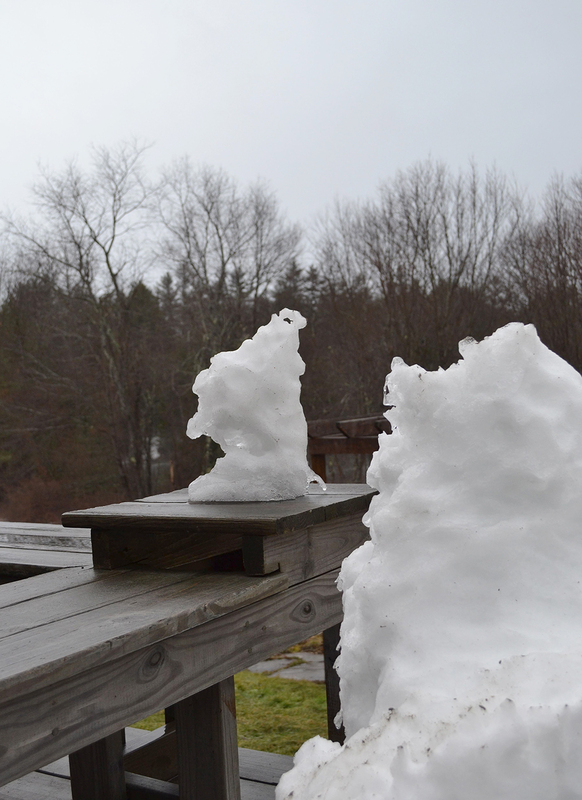 I don’t even have the urge to carve snow creatures this week because it will be above 40°F each day. The icy characters would melt and sublimate before we had the chance to properly bond. I think it’s going to be a messy, hip-deep mud season. Categories: outdoors, spring, weather, winter | Tags: light therapy, melting, mud season, nature, old man winter, outdoors, SAD, seasonal affective disorder, snow, snow pile, snow shovel, spring, weather, winter | Permalink. 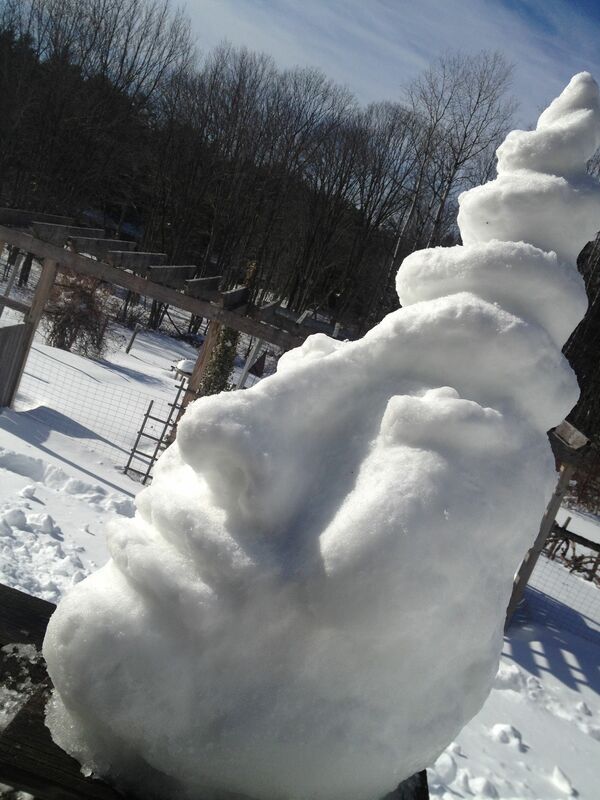 Snow Auger has a saucy attitude about his commanding post on the back deck. We’ll see what the coming rain does to his cheeky angle! 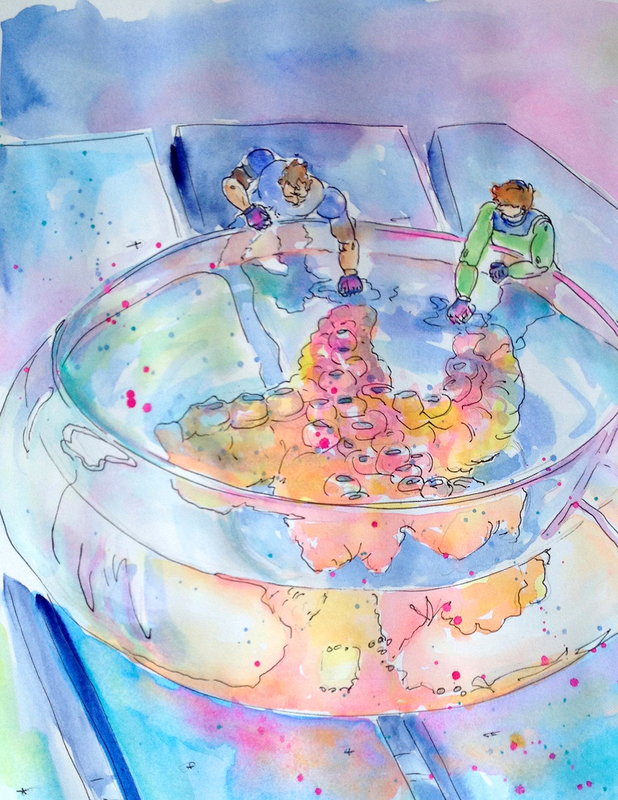 Although the New England dig out is ongoing, the 2013 Blizzard is history. Onward and upward, right? Not so fast… it started snowing lightly here in South Windham, Maine a couple of hours ago, but this is supposed to turn to rain, rendering our stately 35″ of fluffy powder into a cement-like sludge. Yesterday, after shoveling, I rewarded myself with some snow play. I got out our new, squeaky-clean garden trug and used it to mix water into light, puffy snow so that I could slap this Snow Auger onto the deck pedestal. I still long for a nicely behaved storm with proper snowman snow — heavier stuff than we’ve gotten these past couple of storms. Yes, the risk of power outage rises with heavy snow; hence my humble request for a nicely behaved storm… too much to ask? 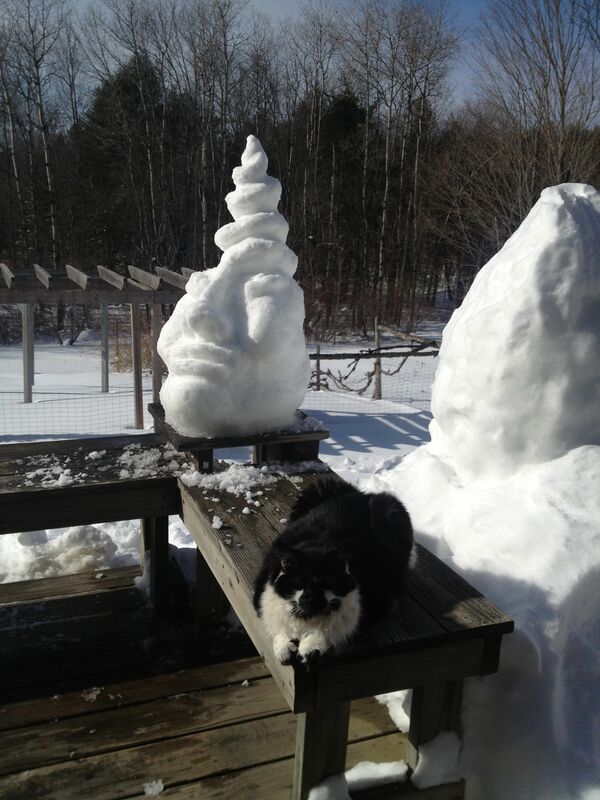 My need to sculpt snow creatures is not yet filled! When I heard the weather report this morning, I envisioned a big drift of snow just outside the second floor bathroom window. Old house rooftops with snow drifts are begging for ice dams and structural compromises so I got the roof rake out at 8 a.m. and scraped what I could from a shed roof we’d neglected to shovel yesterday. Afterward, I allowed myself to sit outside for a few minutes and gaze at my Snow Auger while sipping a mug of steaming tea. A thousand thanks and multitudes of gratitude for the people who keep us safe during winter storms: law enforcement, fire fighters, all those who plow our roads, respond to our emergencies and the brave medical personnel who drive in dangerous conditions to work in our hospitals. Thank you, thank you, thank you! 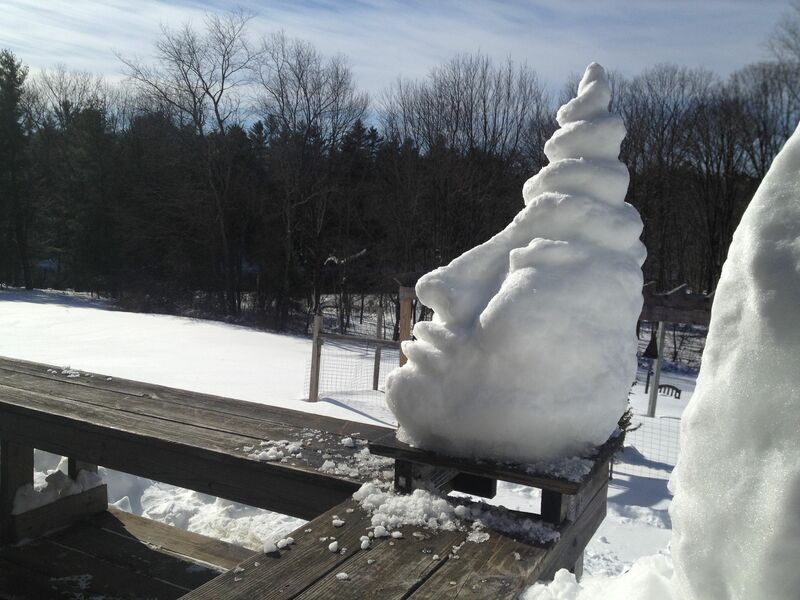 Categories: outdoors, photography, Snow creatures, Updates, weather, winter | Tags: faces, gratitude, ice, melting, outdoors, photography, snow, snow sculpture, snowman, weather, winter | Permalink. The rain and wind have made it to Maine. 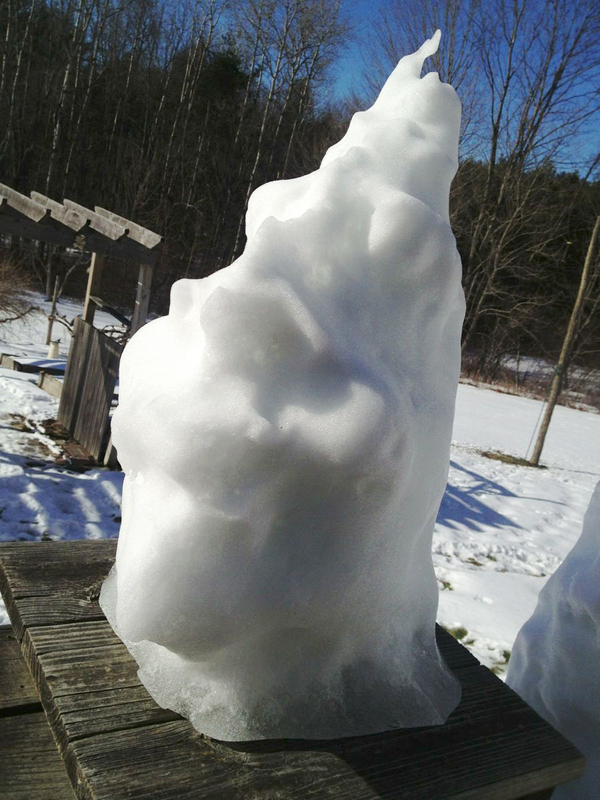 The haughty Snow Wizard is melted down to a stump of its former glory. When we got a couple of inches of snow Monday night, I shoveled the deck snow onto the formerly fabulous and icy Cabin Fever Snow Pile, thinking that the snow in the tracks would protect the ice in the chutes. Against all odds, I had dreams of races this weekend. Now it looks like sulking will be my major activity. It feels so much like late March here. Late March is when Maine finally gets the legendary “in like a lion” aspect of the month. But, January — out like a lion? Categories: outdoors, photography, Snow creatures, spring, weather, winter | Tags: Cabin Fever Snow Pile Races, disturbing images, endings, letting go, melting, mud season, outdoors, photography, rain, snow, snow sculpture, snowman, spring, weather, winter | Permalink. 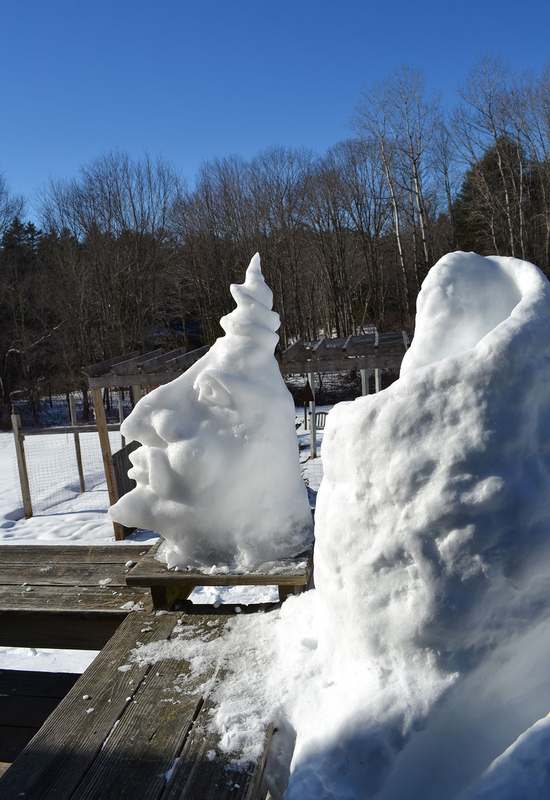 Snow Wizard took a hit this week, sublimating with the sub-zero temperatures, gusty winds and bright sun. This afternoon we repaired the snow pile enough to be able to hold Cabin Fever Snow Pile Races tomorrow but I’ll have to make several trips out with the spray bottle to ice it up after sundown. Am in disbelief and dismayed at our trend of less and less snowfall each year here in the northeast. We didn’t get a flake from the last storm and there’s ice/rain in the forecast for next week. Hope the weatherman’s wrong! 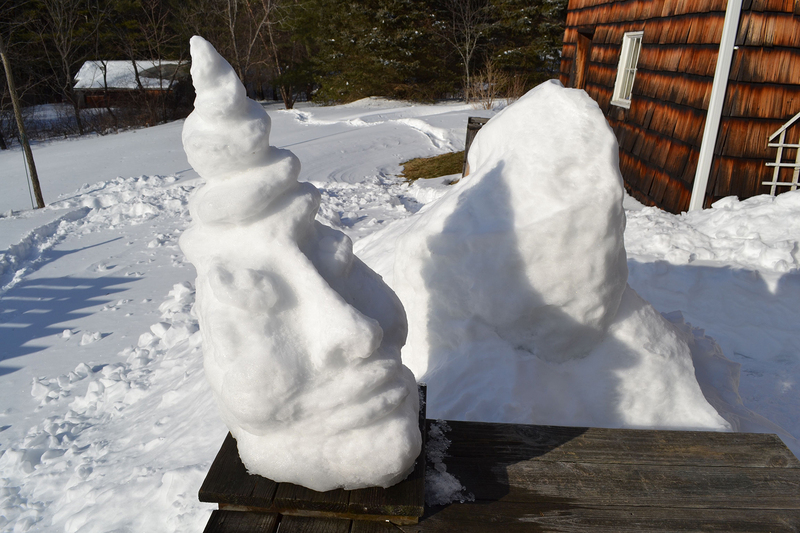 Categories: outdoors, photography, Snow creatures, weather, winter | Tags: Cabin Fever Snow Pile Races, ice, melting, outdoors, photography, snow, snow sculpture, snowman, weather, winter | Permalink.